This is our first Cyber Monday! We hope you enjoy these 3 deals, which are available until 11:59pm, November 27, 2017. And, a special offer for teachers! Everything in the Journeys To Learning store is 20% off until midnight November 27, 2017! No Code needed! Code can’t be used to purchase eGift certificates or portrait sessions. Code can only be used for purchases on Wallner Photography Galleries and online store. This code expires November 27, 2017, at 11:59pm! If you have a portrait session with Wallner Photography, you can have your photos placed on any of these products! The picture perfect gift! There’s something for everyone. Within 24 hours, you’ll receive an email with a printable, one-time use eGift certificate with a code and the amount. You print out and give the eGift certificate. 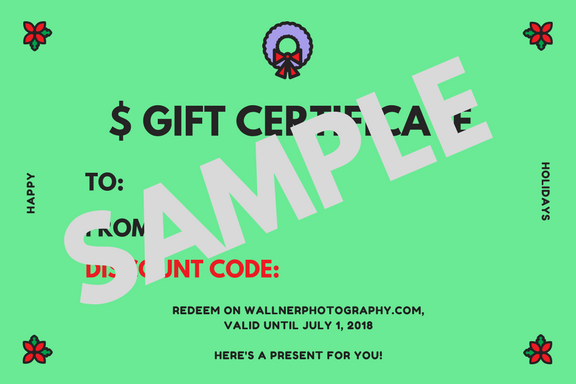 They use their eGift certificate to purchase a gift at the Wallner Photography Galleries and online store. ½ off one Portrait Session! Capture a moment in time with a half-hour photo session on location within the Twin Cities, Minnesota area. Portrait sessions are normally $400. Within 24 hours, you’ll receive an email with a printable, one-time use ½ off portrait session certificate. You print out and give the certificate. They contact joan@wallnerphotography.com to schedule their portrait session. All edited images come with a smaller Facebook ready-to-use file. ©2016-2018 Joan Wallner Photography. All rights reserved.